2017 - "YOU CAN'T GET THERE FROM HERE"
Art duo Casey Sommers and Angela Briggs present 30 new works in their solo exhibition, titled, “You can’t get there from here.” The show’s title refers to the couples’ belief that an aspiration can never be achieved directly – the path to any goal is a wandering one. As collaborative artists, their work constantly transforms as two separate minds, opinions, and tastes combine on a canvas. This duality embodies Fred Rogers’ view on journeys: “Often when you think you're at the end of something, you're at the beginning of something else.” In this body of work, unsettling outgrowths of texture shatter perfect lines, expressing the artists’ past journeys and their often unforeseen outcomes. Casey and Angela’s creation process is slow and intricate – a single piece can take up to a year to complete as they add layers of texture that include gesso, glaze, latex, acrylic, tempera, and spray paint, as well as string, tape, glass beads, rocks, wood chips, tissue paper, and sand. 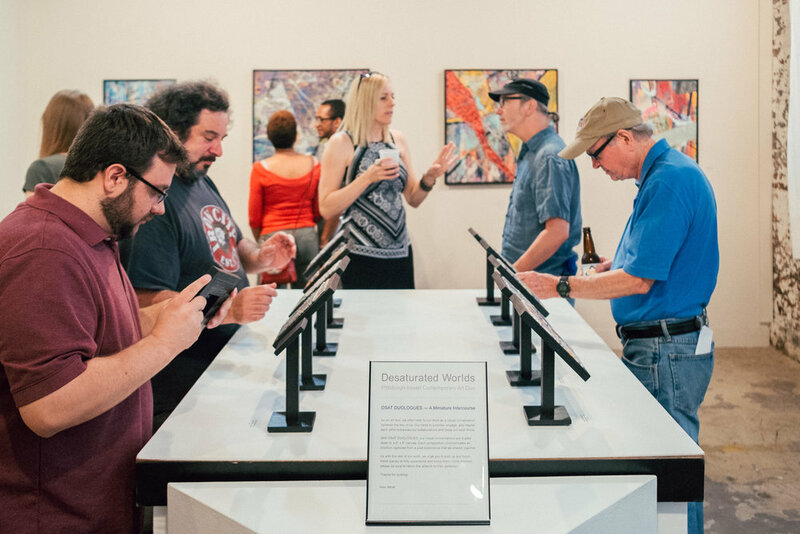 As with past exhibitions, the artists urge attendees of this show to touch their artwork. Angela and Casey are advocates of intimacy between their work and its audience – this proximity can guide viewers on a deeper and more rewarding journey of their own.